A Year of Being Here: Stuart Kestenbaum: "In Praise of Hands"
fields alive with pollen and wings. "In Praise of Hands" by Stuart Kestenbaum, from Prayers & Run-On Sentences. © Deerbrook Editions, 2007. 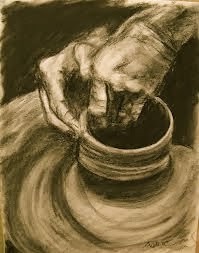 Image credit: "Potter's Hands," found at this link (originally black and white).